Michael Christian Martinez is the first skater from Southeast Asia and the only athlete from the Philippines to qualify for the Olympics in 2014. Michael Christian Martinez, who hails from Muntinlupa, Philippines, had a busy season the first half of the 2014-15 season. The skater competed at three ISU Challenger Series events before his debut on the Grand Prix at Skate America where he finished 10th. The skater is coached by John Nicks, Ilia Kulik, and Peter Kongkasem when he is in California. Due to injuries earlier this season, however, the skater has been only been able to train in the Philippines as he is currently still going through rehabilitation. “Early in January, I was diagnosed with Achilles tendinitis, bursitis, edema, and Haglund’s deformity of the right foot,” he explained. Although Martinez improved somewhat with therapy and rest, he experienced a bad fall during practice prior to the 2015 Four Continent Championships (4CCs) and had to withdraw. X-rays showed that the skater suffered a hip contusion and sprain which resulted in six weeks of therapy. “My doctor also requested an MRI, but since we didn’t have insurance in the U.S., and I was unable to train anyway, we decided to go back to the Philippines for all the treatments and therapies needed,” he explained. At the end of February, Martinez learned that his choreographer, Nikolai Morozov, was in Beijing, China, working with the Chinese teams. However, once the skater arrived in Beijing on 1 March, he sought further treatment from an American therapist at the suggestion of Morozov, and was treated daily. Once the skater was able to complete the elements in his programs, they decided that he could try to compete at the 2015 World Figure Skating Championships. The aim was just to make it to the free skate. “At that time, it was an acceptable goal for me because I didn’t even expect I could compete at all,” said Martinez. However, while his injuries seemed to improve, the skater got sick two weeks before the competition and was rushed to the hospital where he stayed for two days. As a result, Martinez didn’t have much expectations going into the event. In Shanghai, China, Martinez placed 22nd in the short, 20th in the long, and 21st overall. One thing Martinez learned at Worlds, in addition to needing to improve and show more maturity in his performances, was that quad jumps are needed in order to be highly competitive. The 2014 Olympian’s new programs for this season is Beethoven’s “Egmont Overture Op.84” for the short program, and music from Prokofiev’s Romeo and Juliet for the long. Martinez has been assigned to Cup of China in November for his Grand Prix event, however, he has yet to train full time due to physical therapy and rehabilitation. However, when the skater is on the ice and practicing choreography, he sometimes feels the urge to jump. The skater had to withdraw from two summer competitions—Los Angeles Open and Skate Detroit—due to ongoing therapy. He was slated to compete at the 2015 U.S. International Figure Skating Classic, but had to withdraw due to acute asthma. However, he competed earlier last month at the 2015 Asian Open Figure Skating Trophy where he finished first. 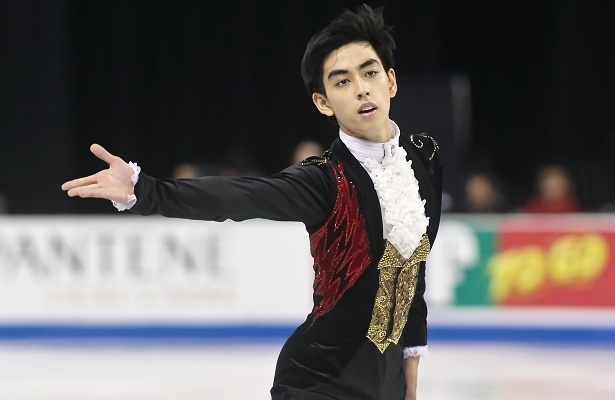 Martinez is currently scheduled to compete Finlandia Trophy in two weeks, followed by Cup of China later this fall.